Stoner is “a perfect novel” said Morris Dickstein in the review that got it all going. Stoner himself is a “perfect protagonist” according to Ruth Rendell. The book stumbled upon first publication and has been reissued a couple of times since, but it wasn’t until its publication by New York Review Books in 2006 that it really took off. Here’s a Publishers Weekly story from April 2013 about the book’s success, which continues to this day. Last week I went to a book event organized by The Community Bookstore at the Brooklyn Public Library on the 18th of November at which Ruth Rendell, Honor Moore, and Daniel Mendelsohn discussed the book under the moderation of Liesl Schillinger. It was an altogether excellent event. And it got me thinking that Stoner is a rather bookish book. The story of William Stoner’s life, Stoner, changes the world which is its subject, Stoner, because of its dependence on him. Books are or stand for his deepest love, and books mark his life’s progress. In a book naked of metaphor, written in simple, slow-moving language reflective of the protagonist’s own internal dialog, the hidden surprise is that the entire work is a meta-metaphor. Stoner isn’t living his life so much as reading a book about it. Panelists spoke about Stoner’s passivity and lack of intervention in events going on around him. Events, often quite dramatic, do come up. Stoner, however, takes in the events reflectively and for the majority of us justly, and then turns to the next page. When his wife would rant at him “. . . Stoner looked upon it all—the rage, the woe, the screams, and the hateful silences—as if it were happening to two other people, in whom, by an effort of the will, he could summon only the most perfunctory interest.” His action consists in deciding not to act, as we all must do when reading a book. We sometimes feel like shouting “Bill, don’t do it” but we never do. We remain silent. Readers always remain silent, but not unchanged. Stoner is no different; he is reading the book of his life, the book of life. Maybe it’s no more than a cheap coincidence, but if Stoner had been working in a British university his job title, as he never got promoted from assistant professor, would have been Reader. “It hardly mattered to him that the book was forgotten and that it served no use; and the question of its worth at any time seemed almost trivial. He did not have the illusion that he would find himself there, in that fading print; and yet, he knew, a small part of him that he could not deny was there, and would be there. “He opened the book; and as he did so it became not his own. He let his fingers riffle through the pages and felt a tingling, as if those pages were alive. The tingling came through his fingers and coursed through his flesh and bone; he was minutely aware of it, and he waited until it contained him, until the old excitement that was like terror fixed him where he lay. The sunlight, passing his window, shone upon the page, and he could not see what was written there. 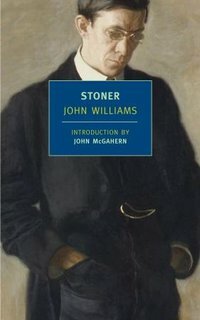 John Williams: Stoner (1965) New York Review Books. Williams’ two other great books, Butcher’s Crossing (1960) and Augustus (1972), have also been reissued by New York Review Books. If you have not read these, please do so.